We found ourselves awake at 5.30 on our last day in South America, excited to be going home after this mammoth time away. I felt that I had one foot still firmly in the trip, and another at home. I was feeling desperate to see everyone that I've missed so much, especially now my mind is so much in home mode. On our last night we went out with Marc, the Canadian guy we met on Ruta 3 at the beginning of last week. It was a good evening, he has spent a lot of time in Buenos Aires and took us on a short walking tour, before we arrived at a good steak restaurant he knew. Patrick had decided to have an early night after he had enjoyed his daily two scotches, so we missed him on our last night. Patrick has become a great friend this last few weeks, and we shall miss his wonderful French humour (full of teasing to us Brits). He helped to make our last days in South America more enjoyable, and we hugely admire his spirit and love of life. It must be tempting when given a diagnosis of lung cancer to want to stay safe at home, but Patrick kept himself going all throughout his treatment and removal of a lung by dreaming of his trip to Central and South America, and then when he could turning it into a reality. His wish to see a penguin became legendary........ We truly hope to meet up again when Patrick comes to Europe in the summer. 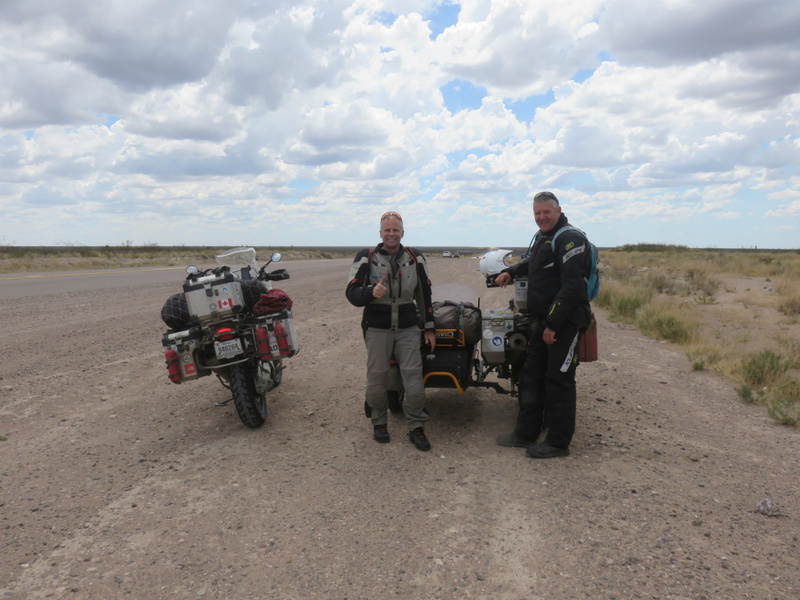 Our bike and sidecar like us left on Thursday, and will be taking a circuitous route to London Heathrow airport, as it will be flying to Canada first. So we understand it should be arriving in London today. Motofreight, the shippers we used when leaving for the US, back in June will collect it for us, and then when it's ready we can visit their warehouse to go and bring it home. After that we shall have to give our trusty steed some loving care, a service, new chain, new tyres that sort of thing. But, we can safely say it's done us hugely proud over the 32,000 miles we've ridden together in the last year. And a proper daily dose of healthy fruit and veg, something we've found it difficult to live without, especially over the last six weeks in Argentina. No more SPAM! Yesterday, we went to meet Javier and Sandra from Dakar Motos to check over the paperwork, and receive instructions for the packing and preparation of the motorcycle and sidecar. They have over 10 years experience of airfreighting motorcycles around the world and speak superb English, which is wonderful. We’d contacted them only two weeks prior to arriving in Buenos Aires and they are very accommodating. We visited their home office with Patrick, taking a taxi, as it was still raining cats and dogs. After having been there about 10 minutes, another lady, Michelle arrived on her bike (which is the same as Patrick’s, a Kawasaki KLR650). Michelle is having to return home to Las Vegas to return to work after a 4 month trip with her husband, beginning in Vegas, but sadly for her ending in Buenos Aires. Michelle’s husband is riding on alone to reach Ushuaia before he returns home. The details took around an hour, and we left clutching the photocopies of important documents required for customs clearance, and a list of do’s and don’ts for packing. I wasn’t going to be allowed into the cargo area, so I stayed behind this morning. 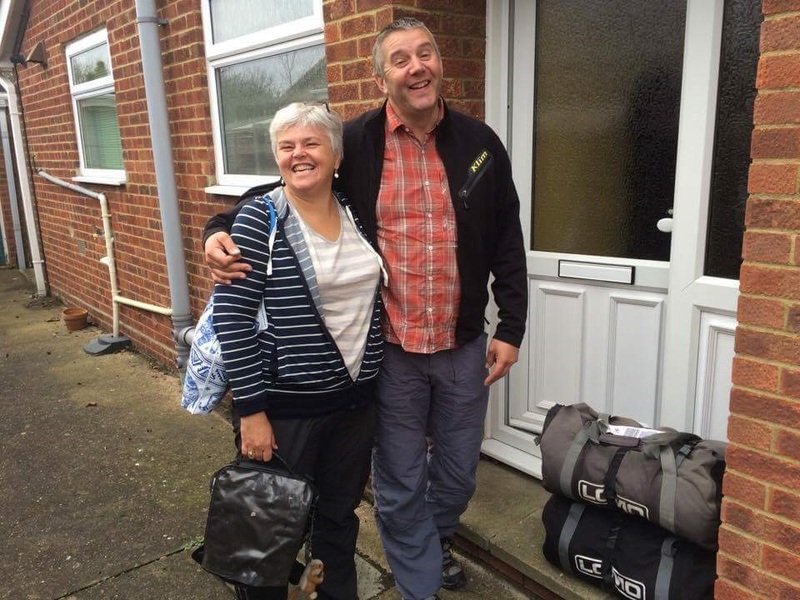 Patrick and Paul set off in the rain at 10, to make the 10 minute journey to the airport where they met up again with Michelle, and spent a productive 2 hours removing screens, disconnecting batteries, trying to get the last drops of petrol out without too much success! They had Franco from the freight forwarding company to guide them through every step. The customs men checked the bikes and Paul and Patrick were free to go, excellent news! They returned pronto in a taxi. We’re hoping to meet up with Michelle for dinner tomorrow night, as we move hotels to spend our last three nights in Argentina in downtown Buenos Aires. Home is getting nearer everyday! Only one more night’s sleep and we’ll be in Buenos Aires. It’s still going to be a week before we fly home, so hopefully once the bike is ready for air freight, then we’ll have some time to have a look at downtown Buenos Aires. Last night in Bahia Blanca, we met with Patrick again, which was great. Patrick was very relaxed as he’d had two days off and treated himself to something to remember his trip by: A tattoo of his sticker design, which includes a penguin, the letters KLR (the model of his bike), and Ushuaia, Argentina. 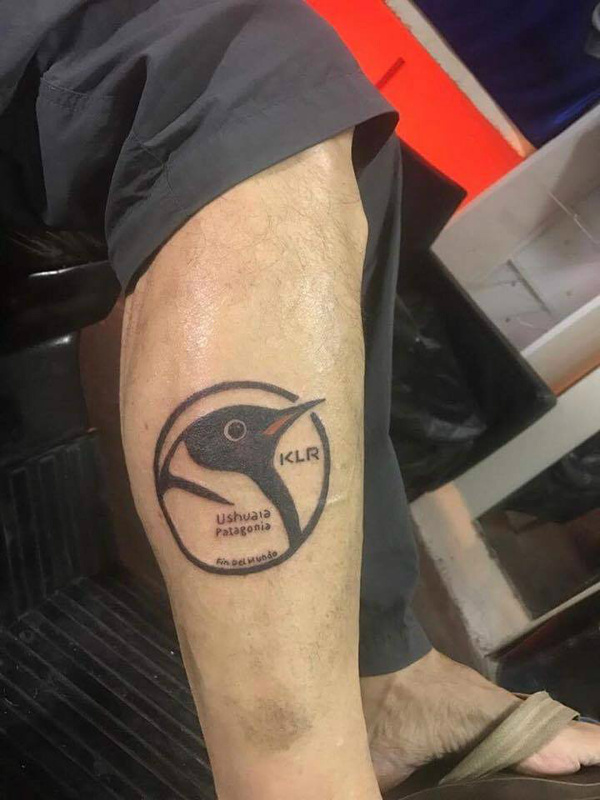 It’s on his leg, his first tattoo at 63 years old, and he’s very proud of it! We were gettng swept along in the moment and almost found ourselves agreeing to have matching Ushuaia tattoos, before coming to our senses! We set off this morning after a little wait for someone to move his car, so that we could leave the hotel car park, then we were on our way. Google maps had chosen us a route for the 200 mile journey which took us away from Ruta 3 for the first time in almost three weeks. It was great, a quiet road, with different scenery as we are now in the Pampas region of Argentina. In this region there are many more fruits and veggies grown and sold, and I could smell the trees, which was wonderful after all that barrenness for so long. We pulled into a petrol station, and lo and behold there was Patrick sitting outside in the sun, chuffing away on his cigarette, whilst drinking his obligatory cafe-au-lait, and eating a croissant- of course, what else for a French man? We didn’t ride on together even though our destinations for the day are similar, as Patrick, like us, enjoys riding alone, pleasing himself. We did pass him one more time as he had stopped for a break. It was a shame he wasn’t the other side of the roundabout as then he would have seen Paul raising me high into the air in the sidecar, where the roundabout shape caught him out a little bit!.. 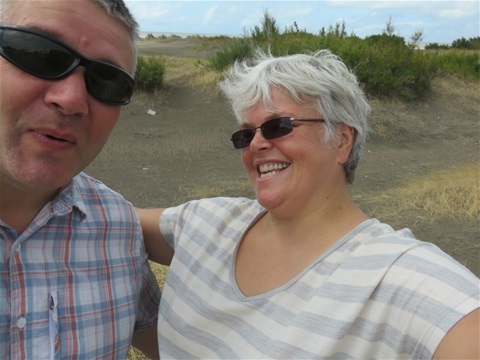 I smacked his leg, and he turned laughing to me- it’s a funny old sensation being lifted up, and after almost 32,000 miles Paul’s certainly used to the whims of old bikey now! Patrick wanted us to go to his hotel tonight, and tried to sell it to us by saying ‘it has karaoke!’. We opted to go with our original plan, which is an estancia (old grand house) tucked into the countryside away from the main road, with woods and a river nearby. No doubt we’ll be encouraged into more of Patrick’s ways again tomorrow night when we’ll all be back together again. This will mean at the least one or two glasses of alcohol, many cigarettes (Patrick only), and definitely no karaoke! 09.02.17 Balneario del Condor, Argentina (East Coast). We only rode a short way yesterday, just 130 miles along Ruta 3, and then took an 18 mile detour to the coast. We had been told that Balneario del Condor is a good resting spot, a remote kind of beach side town with a good promenade, and apparently the largest colony of parrots in the world (I’m not convinced of that- we’ve only seen a few parakeets hanging about in the trees!). It’s very nice though, with dark sandy beaches full of people swimming and enjoying the sun. We took a good walk along the promenade to visit the supermarket, and we have a peaceful little apartment, just right for recharging our batteries for a couple of nights. Buenos Aires is getting closer, Patrick, our French American pal, is a day ahead of us, but says he will still be in Bahia Blanca tomorrow night where we are booked in. It’s a very strange feeling, we seem to be marking time in a way we haven’t before. We don’t want to arrive too early in Buenos Aires, as we are booked at the airport hotel for a couple of nights from Sunday, and we don’t want to have to park our bike in the huge car park for too long, where it may be vulnerable. 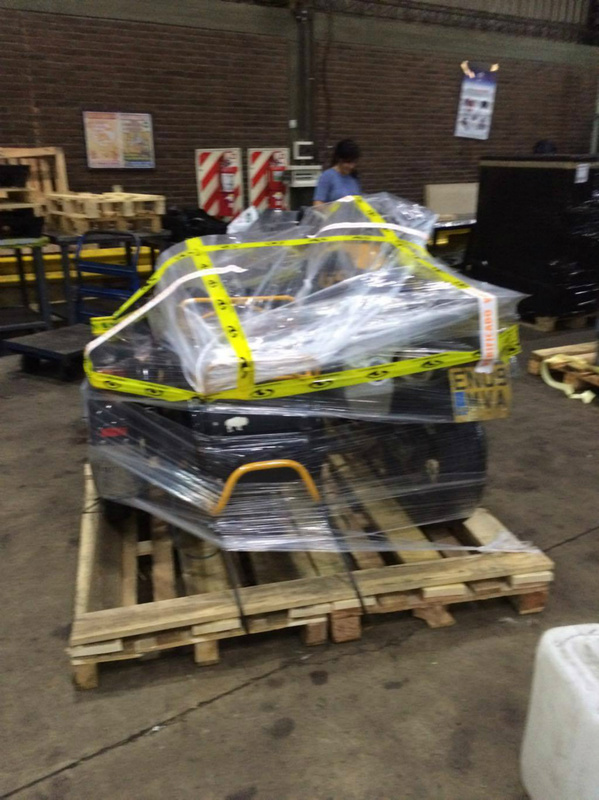 We are currently arranging with Dakar Motos, who are based in the city, to air freight the bike back to Heathrow airport, where Moto Freight, the company we used to air freight the bike to New York, will collect and unpack it for us. They require us to be in town four days before the bike flies. There is also the necessity to set up payment in advance through our bank, in US Dollars. So there’s lots to think about. We have been told we are not allowed to send anything with the bike that does not relate to the bike, so we must remove our sleeping bags, all clothing, first aid kit, anything flammable and all electronics. We shall have to carry these with us on the plane instead. Our thoughts are really turning to home now, and the list is growing daily of ‘things to do’- one priority is to get to the dentist, Paul broke a filling on the plane on the way to New York, and I broke mine a few weeks later. Whilst neither gave pain for very long, it’s definitely important to get these seen to by our dentist. So, to the practical things of daily life, and oh! the utter joy of having my own washing machine that I can use whenever I want will be astounding. Whilst writing, I imagine that the appreciation of the little things like that, that I would normally take for granted, would stay with me, but no doubt, in two weeks, I’ll give it no thought at all. We also look forward to making familiar choices of ingredients for cooking, to eat better, and more healthily than we’ve been able to for months. Paul, as you know, in particular is looking forward to ‘real ham’. But the real joy will be in seeing our family and friends after all this time. Oddly, because of social media and the internet, we have never felt that far away, and it is wonderful to be able to be in touch most of the time, to see what the important people in our lives are doing, just as they have us. But, to actually see and be able to hug people, in real life! Now that’s going to be amazing. The wonderful lady at the tea rooms made us a great breakfast this morning. She made us some eggs! Wow, after such an egg absence that was amazing. Although what was more amazing was that when she was asking what we would like yesterday and Paul said ‘eggs’, she said ‘oh, how do you like them?’. When we told her fried or scrambled, she didn’t know how to cook them. She runs a tea room, and has only ever made boiled eggs before! No wonder last week when Paul was trying to get fried eggs in Ushuaia they kept bringing scrambled eggs. It seems totally astounding to us, but no, really the Argentinians eat cake, bread, cheese and mystery meat for breakfast. Boy oh boy, we have been eating mystery meat since the beginning of October. Throughout Central and South America whenever you ask for ham they will bring you what can only be described as Spam, at best. In fact, last week, I had finally managed to get my hands on some Gluten Free Bread, and when Paul ordered a sandwich from the hotel bar, I decided to join him in asking for the ingredients and making my own up. Now, Gluten Free is something that is provided for in the supermarket, but does not seem to be understood or tolerated in restaurants or hotels. I have been consistently met with a blank face, or just told no when asking for alternatives to bread. Anyway, Paul asked for me if it was possible to have the ingredients to make a Club Sandwich, and was told no, the sandwiches were pre-made. Ok, fair enough I think, and Paul tries to ask for the ‘special ham and cheese’. This gave the impression of being a good cut of ham and some nice cheese- what came for me to fill my sandwiches was enough cheese cubes to fill two cheese and pineapple hedgehogs at a children's party, and enough Spam to feed us for a week (if we had been so inclined). A similar thing had happened to Patrick in another hotel where he wanted a plate of speciality meats, asked to check there was ham, and of course when the plate came there was not a speck of ham, or Spam to be seen! Anyway, enough Spam chatter. We had a smooth and easy ride, apart from the last 45 minutes today where the wind made it’s very violent return, despite us having left Patagonia now. We have stopped for the night at a tiny seaside place, called Las Grutas, which appears to be full of apartment homes for the summer. It is peak season here at present and so is very full. Along the way today we had the pleasure of meeting a Canadian guy Marc. He stopped to say hello, and it turned out we’d been chatting via Horizons Unlimited, an adventure motorcycling network. Marc had just reached Ushuaia last Saturday (one week later than us), and has already caught us up and overtaken us on the road. He is making his way swiftly up to Buenos Aires, as he has rented an apartment for a month. He invited us to join him for dinner, when we reach there, so we can swap stories of the road. That will be fun, and we’ll look forward to it.